The truly most interesting aspects of the current exercises in Israel is that the United States has never had any formal alliance with Israel and has absolutely no national interest in becoming involved in Israel’s wars at all. The assumption that the U.S. might be called upon to help defend Israel is not based on any strategic reality, which is not to say it might not happen if Congress and the White House have their way, but it would likely be a double war of aggression, with Israel attacking the militarily much weaker Lebanese followed by the United States weighing in to finish the job after Hezbollah tries to fight back with its batteries of rockets. That Washington is the Israeli poodle in the current situation is made clear by the recent opening of the first U.S. military base in Israel. It is described as a base within a base as it is completely contained by an Israeli air force installation and operates “under Israeli military directives.” It has no function in support of U.S. regional interests but is instead a shell headquarters with limited support facilities that can be ramped up considerably if Israel goes to war and calls for American assistance. 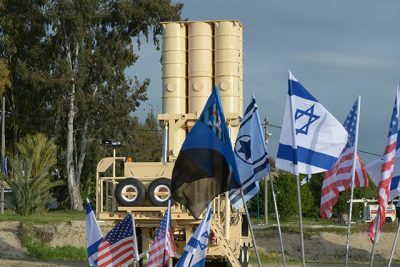 Together with billions of dollars-worth of U.S. military equipment that is pre-positioned in Israel and can be used by the Israelis as needed, it is all about supporting Israeli war-making and has nothing to do with American security or defense interests. Maneuvers are supposed to simulate possible future military actions, bloodless battles that provide lessons learned for future engagements, suggesting that some genius in the Pentagon who initiated these biennial exercises under George W. Bush, expects American soldiers to assist in the Israeli mission to remake the Middle East in their favor. Pentagon number two Paul Wolfowitz, who had an unseemly close relationship with Israeli military visitors, comes to mind as a possible candidate. Israel has actually been planning to invade Lebanon. Last September it held its largest military exercise in over twenty years around the theme of a ground invasion of Lebanon. Israeli soldiers even dressed as Hezbollah militiamen as part of the training. There have been repeated warnings by Israeli government officials that there are several red lines that will bring about an Israeli attack, to include evidence that Iran is aiding the development of sophisticated “missile plants” in either Lebanon or Syria. The evidence for such plants is otherwise reported to be apocryphal or perhaps even fabricated, known only to Israeli intelligence, but they should perhaps be seen as a pretext for war and not necessarily based on fact. Apart from having no compelling interest to get involved in the latest round of bloodletting, the U.S. would be well advised to keep its distance from Benjamin Netanyahu’s schemes to destroy Hezbollah’s power as crushing Lebanon would produce the same kind of regional catastrophe as did the U.S. led Iraq invasion of 2003. Israel’s Minister of Transportation Ysrael Katz recently warned that Lebanon will be “razed to the ground” and “returned to the stone age” if Hezbollah proves able and willing to fire any missiles at Israel. Israel is itching for a fight and working hard to get Washington involved, not a difficult task given the belligerent proclivities of those who gather to discuss national security strategy in the White House. Viewing Israel’s recent actions relating to Gaza, Lebanon and Syria, it is clear that Netanyahu’s government is the aggressor and is both willing and able to destabilize the entire region without any regard for what happens next. It has already warned that its expected conflict with Lebanon will also involve Syria and that the ultimate target is to eliminate Iranian influence in the area. Bombings of neighboring Syria by Israeli aircraft have also intensified, leading to the shooting down of an Israeli jet by Syrian air defense forces. The U.S. media covered the story but largely ignored the fact that Netanyahu has launched hundreds of airstrikes against a country with which it is not at war, again using the false claim that Israel is acting defensively and it is Iran that is doing the “interfering.” Of course, the United States in Syria has done much the same thing, lying about developments before setting up an ambush last week that killed 100 Syrian soldiers. That Washington is dancing to the tune being played by Israel to dismember the Middle East makes the American government an accomplice when the war actually does break out. And it will undoubtedly also have to do much of the fighting. That the United States appears to be committed to defend Israel, even if Israel starts the war, is deplorable and is particularly so as there is no reciprocity. Israel has never fought side-by-side with the United States and if Washington actually finds itself in a situation where it needs Israeli military assistance or support don’t count on it. Featured image is from Israeli Defence Forces/Flickr.